Given the choice of breakfast, lunch, or dinner, I will always rebel and choose brunch. There’s something about brunch food that gets me excited to eat. For one, who doesn’t love eggs covered in cheese with a side of crispy breakfast potatoes. Or if you’re in the mood for something sweet, a stack of fluffy pancakes with a side of sweet syrup. Ummm…yum! A weird fun (?) fact about me – I love looking at restaurant menus, even those in different cities I have yet to visit. And brunch menus are a personal favorite! If you live in Chicago or have ever visited, you know this city takes the brunch game to the next level. There are so many amazing options to choose from. I don’t think we’ll be able to cover them all by the time our next move comes around. Insane! 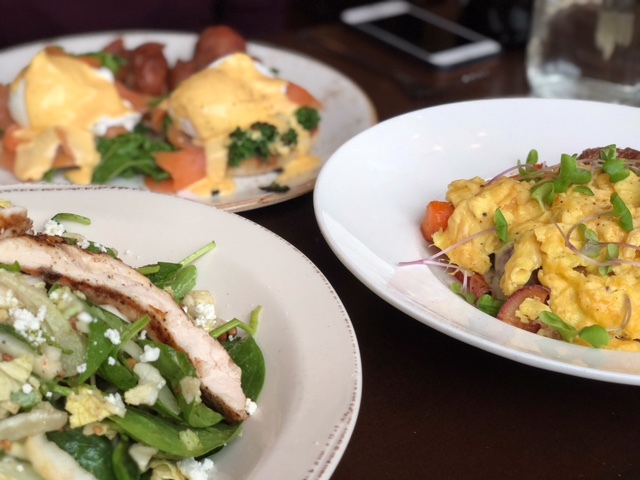 Farmhouse definitely takes brunch (and food in general) seriously! The menu is filled with fresh, local, and carefully selected ingredients. While not healthy by any means, it’s the kind of food you feel good eating. It feeds your belly and your soul! I’ve had the pleasure of eating at Farmhouse several times and have yet to be disappointed. However, our most recent dining experience topped them all. Vishnu, my friend Jigna, and I started by sharing an order of the cheese curds. OH MY! Little bites of gooey, perfectly battered heaven. These bad boys are fried but still very light. Literally melt in your mouth perfection. This dish is also served with two dipping sauce – homemade ketchup and spicy ‘curd’ sauce. 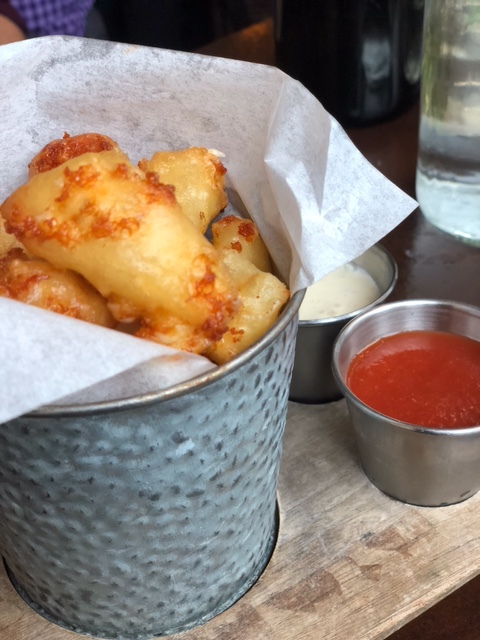 The ‘curd’ sauce, as strange and unappetizing as it sounds, is the perfect condiment for cheese curds and anything else you want to dip in it! For my main meal, I ordered the Vegetable Hash. Trust me when I say, the name of this dish doesn’t do it justice. My bowl was filled with Fall vegetables like Brussel Sprouts, squash, tomatoes, and green beans and topped with perfectly cooked scrambled eggs (the way I like my eggs!) and a spicy horseradish cheese. On the side, I enjoyed spicy breakfast potatoes that were crispy on the outside and creamy on the inside. Vishnu ordered the Midwestern Autumn Salad with chicken. He let me sneak a bite of the veggies before he dug in. I loved the flavors and textures, especially the cabbage, apples, goat cheese and pecans. Definitely recreating this at home! Jigna ordered the Salmon Benedict and judging from the beautiful presentation and the fact that Jigs finished her meal, I think it was a pretty delicious dish. So that’s the food…as you can see, you really can’t go wrong! Now let me tell you about our service experience. In one word, it was surprising and heartwarming! The last time I ate at Farmhouse was back when I was probably eight months pregnant. A college friend of mine was in town and suggested we meet for brunch. I remember our waiter being really funny and kind, but that’s about it. Well, guess what?! We ended up with the same person this time around, and the only way I know is because he actually remembered me! He asked about the baby, so I proceeded to show him a few pictures of Kaiden! And then, to top it off, he didn’t charge us for the cheese curds as a way to say congratulations. Ummm…who does that kind of stuff anymore?! The staff at Farmhouse that’s who! Vishnu and I (and Jigna) were blown away by this small act. So not only did we have a great meal, but we also left touched by the thoughtfulness (and memory) of our great waiter!